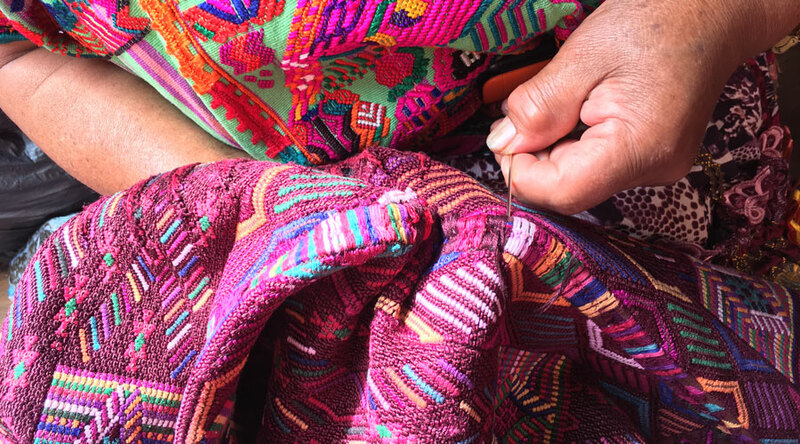 On our recent trip to Guatemala, we spent some extra time getting to know the process of creating the country’s beautiful and vibrant textiles. There is a lot of work that goes into every step of the creation process. 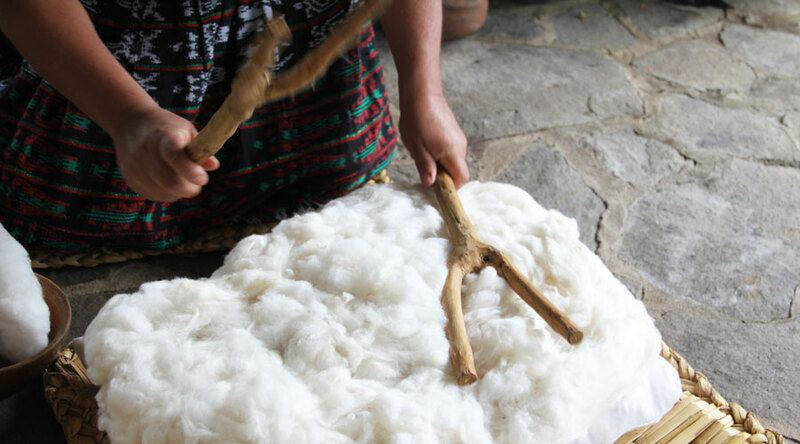 We left Guatemala with a newfound love and appreciation of artisan handcrafted textile work. Artisans use wooden sticks to beat down cotton and loosen its fibers. 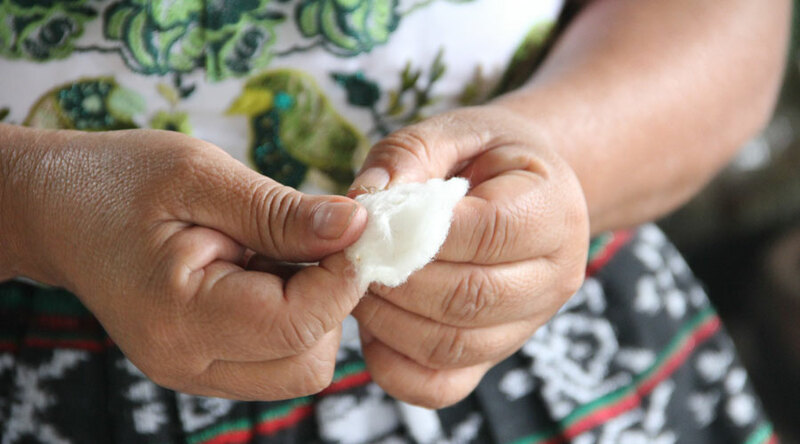 It all starts with raw cotton, which the women beat down with sticks to soften the fibers. After the cotton can be separated easily, they take small handfuls and pull it apart. A final cleaning by hand removes any unwanted debris. This process cleans the materials and removes any debris that may have been hiding in it. Spinning cotton by hand is a common way to create threads from raw materials. After it’s been carded and cleaned, the artisan pulls a thin piece from the bundle and spins it to create a thread. 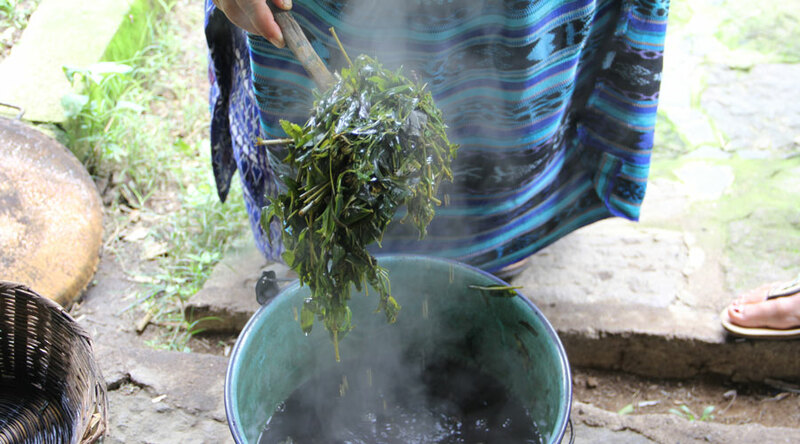 Artisans use naturally occurring materials to create dyes. One of the most dramatic aspects of preparing materials for weaving or embroidery is the dyeing process. 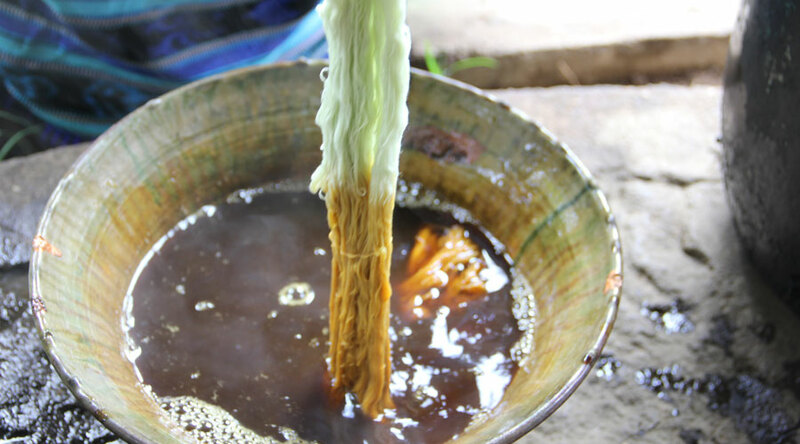 Most threads in the area are dyed using natural materials, including fruits and vegetables grown in the region. On the particular day of our visit, this women’s cooperative was using banana peels to dye their cotton the most amazing green-yellow hue. Leaves and herbs help temper colors and bind the dyes. Standing looms arrived in the area in post-Spanish times. 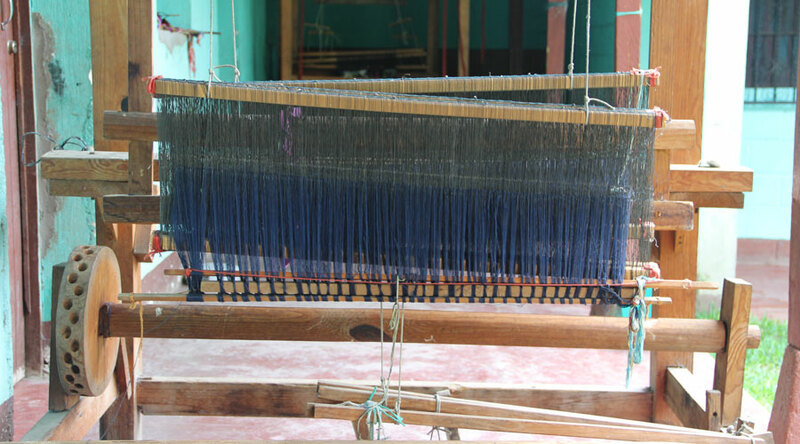 Most textiles in Guatemala are woven on two different types of looms: the backstrap or standing loom. 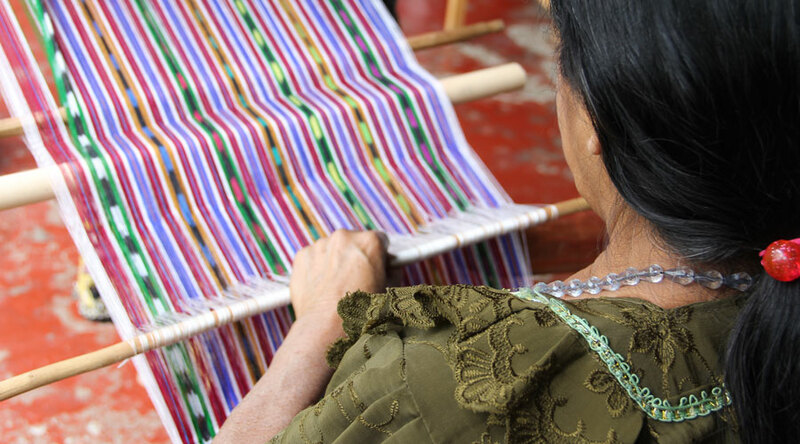 Backstrap looms have been present in Mayan culture since pre-Hispanic times, when artisans worked with natural fibers like cotton and silk. When the Spanish arrived in the 16th century, they brought with them large standing looms like the one in the image above. An artisan weaves on a backstrap loom. With a backstrap loom, a weaver – usually a woman – straps a leather belt around her back that attaches to a small wooden loom. She ties the other end of the loom, which can be several feet away depending on the length of the textile, to a tree or something tall and sturdy nearby. 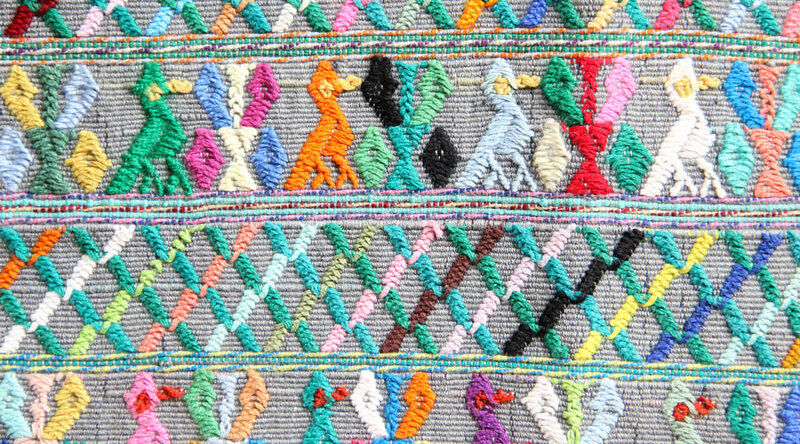 The unique characteristic of a backstrap woven textile is that it is usually quite narrow — and that is because there is only so much width a weaver can reach while holding onto the loom. Often the width of a backstrap woven textile is a good indicator of the individual weaver’s arm span! 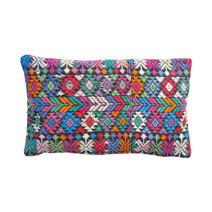 Guatemalan embroidery is intricate and colorful. 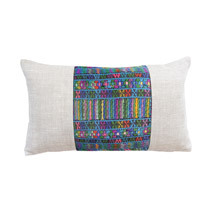 In addition to hand woven fabrics, Guatemalan textiles are known for their intricate and colorful embroidery. 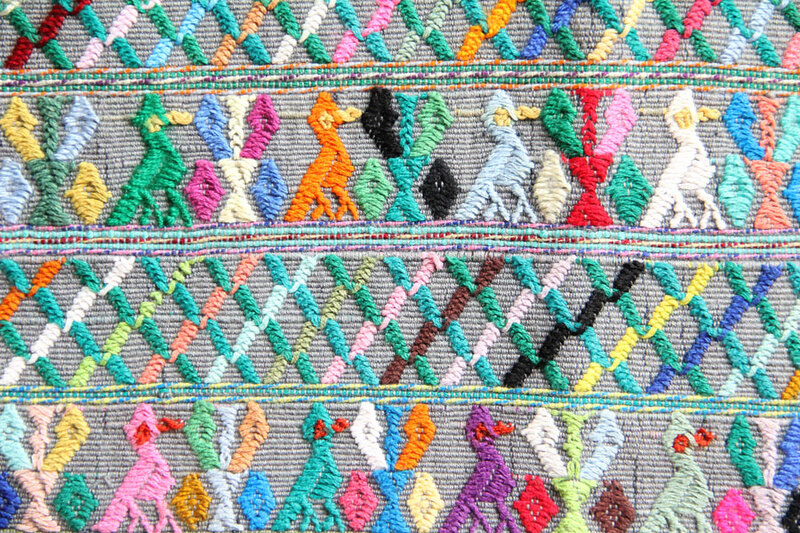 There are no machines here – all embroidery is done by hand with a needle and thread. 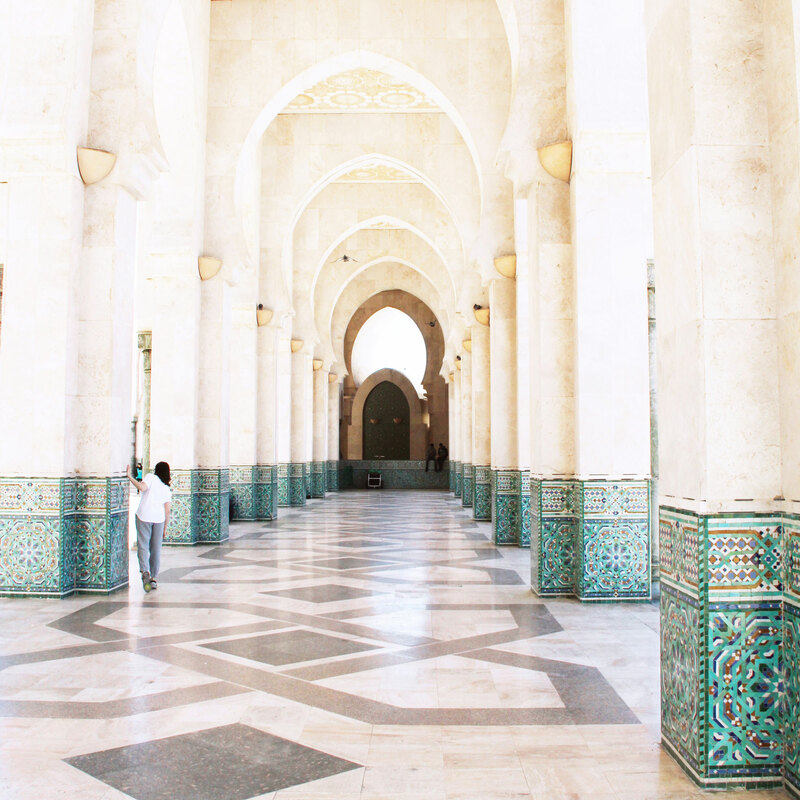 Often patterns are memorized or created as the artisan goes, which makes for beautiful and subtle nuances in each one-of-a-kind piece. A traditional huipil is proudly on display. 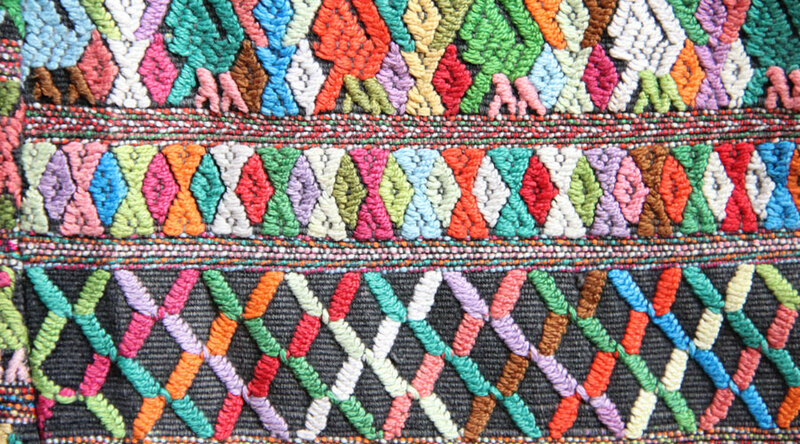 Each village around Guatemala – many are in the highlands region where we were – specializes in a distinctive color scheme or pattern in their weaving and embroidery. 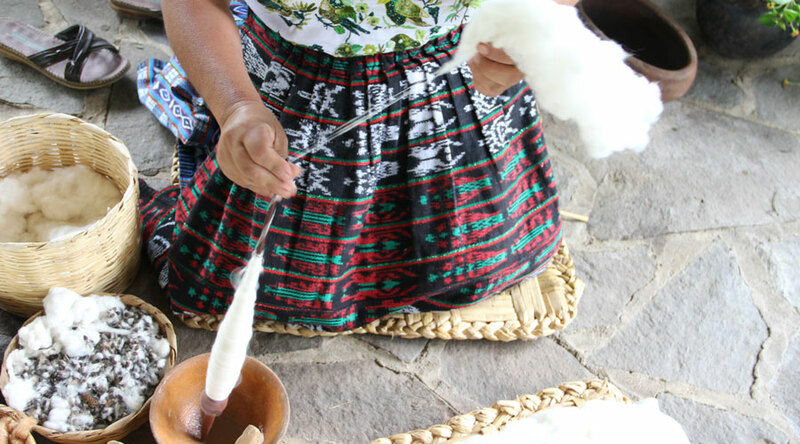 The traditional textiles found in Guatemala, including huipils (a square shaped embroidered blouse worn by the locals) and cortes (a panel textile that is tied around like a wrap skirt and often found in ikat patterns or in naturally-dyed indigo), are all made by hand using traditional techniques and methods that have been passed down for generations. 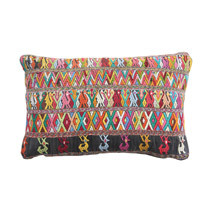 Embroidery from the Nawala community is characterized by light and faded pink details on white backgrounds. This pretty and faded embroidery is from a Nawalan huipil. 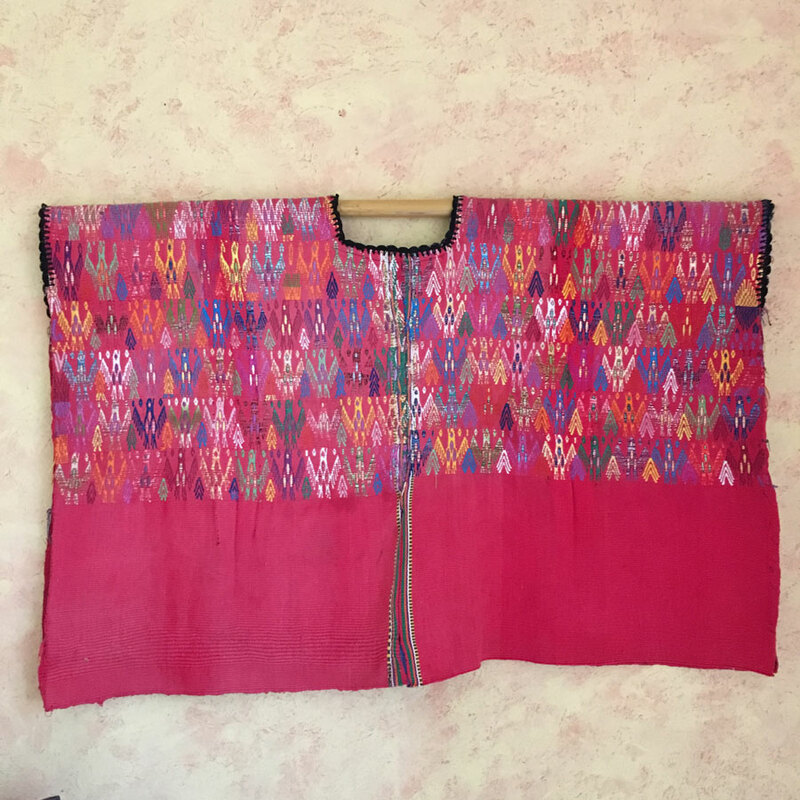 After seeing more from our artisan partners, we quickly learned that some our favorite embroidery styles were from Nawala, a small K’iche’ community in the Sololá municipality. 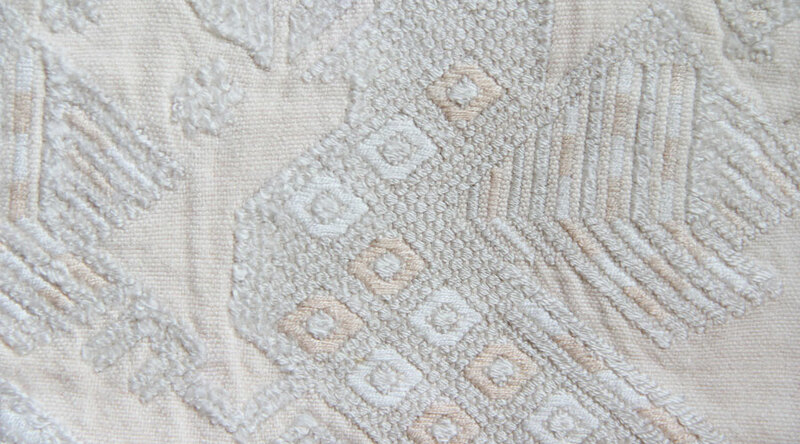 We immediately were drawn to their light and faded pink embroideries on white backgrounds. In stark contrast, this embroidery from San Juan Cotzal features vibrant colors in graphic, linear patterns atop a darker base. The bright colors in this huipil really pop against the darker background. We were also enamored by huipils from San Juan Cotzal, a municipality that is part of the Ixil community about 270 km from Guatemala City. 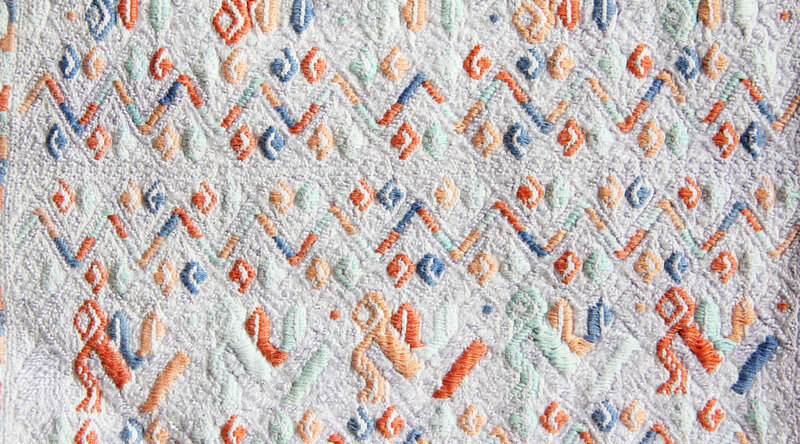 These textiles are characterized by vibrant embroidery in graphic, linear patterns atop a darker base such as grey or green. There was so much to learn and love in Guatemala that we look forward to making a return trip soon. For anyone who appreciates textiles (guilty as charged!) 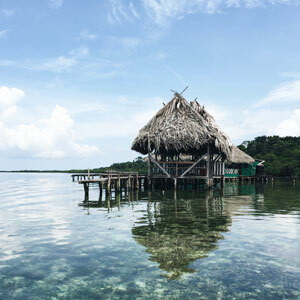 or bright, colorful hues, Guatemala is the ultimate place to visit. They also make a darn good cup of coffee. 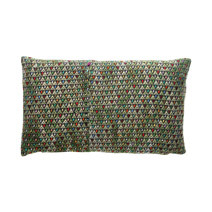 Do you have a favorite textile? Where is it from?